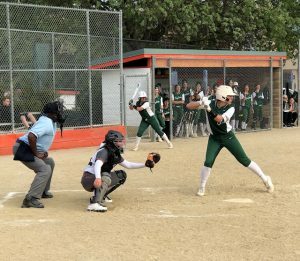 A pitcher’s duel at Atascadero softball field between Ashley Daugherty of Templeton high school and Bailey Doherty of Atascadero. 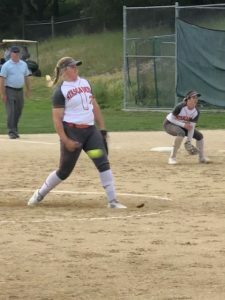 The greyhounds Bailey Doherty won the duel, throwing a no-hitter and striking out nine Eagles. Bailey walked only one batter. Ashley Daugherty gave up only two hits, but that led to two earned runs. The Greyhounds won the game 2-0. That puts the Greyhounds back in a tie for first in the Mountain League with the Paso Robles Bearcats. Both teams are 8-1 in conference play. The Greyhounds play Morro Bay at 11:00 this morning. Part of the best of the west tournament. The Paso Robles Bearcats are at home this afternoon against the Arroyo Grande Eagles. That softball game begins at 4:30 at Paso Robles high school. In baseball, the Templeton Eagles host Righetti at 4:30 this afternoon. The Bearcats play this at 4:30 this afternoon at Arroyo Grande.